Apologist and storyteller Dale Fincher is a national teacher and speaker, addressing thousands of high school and college students every year through their non-profit Soulation (www.soulation.org). As co-founders, Dale and his wife, Jonalyn, frequently travel and speak as a husband/wife team. And when not on the road, his ongoing reflections can be found at his blog (www.dalefincher.com). Dale recently moved to Steamboat, Colorado, which he says reminds him a lot of Narnia. He enjoys flyfishing and hiking the hills with his wife and their three corgis. 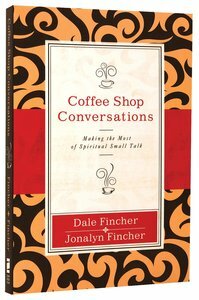 Customer Reviews For "Coffee Shop Conversations"
I bought this book thinking it would give me ideas as to how to bring a conversation around to talking about Jesus. It was so much more. It corrected my old fashion view of evangelism and gave me practical teaching for me to move forward in my relationship and understanding of Jesus so that sharing about Him becomes a  natural outflow of my life and understanding of who Jesus really is and how He really thought about people. This book helps to make evangelism a genuine outflow of your life not a forced add on.